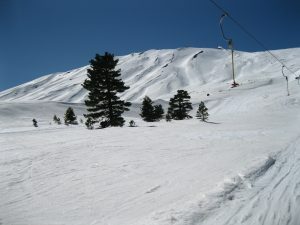 Skiing in Sicily. 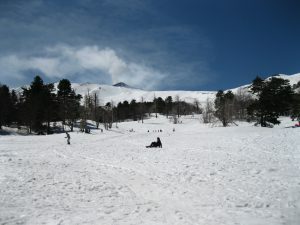 Piano Provenzana – Etna Nord. Sicily in winter? Why not! We are so lucky in Sicily! 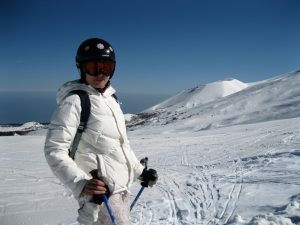 From May to November enjoying the sea, and in January, February and March, getting snow-mad on Etna. On the northern side of Mount Etna, above town of Linguaglossa, at an altitude of 1810 meters the Piano Provenzana is located. 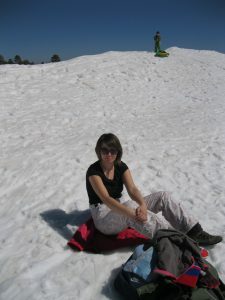 This is where you can enjoy the snowy winter. Piano Provenzana is thriving all year round. 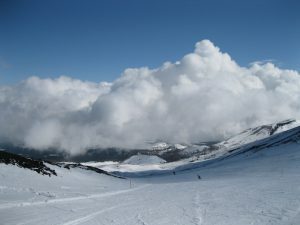 It is a vast square where you can find souvenir boutiques, ski equipment rentals, bars and agencies that organize excursions to the top of Etna. There are also ski and snowboard schools here. At Monte Conca bar & restaurant you can warm up, have a tea or mulled wine and taste a home-cooked meal. Piano Provenzana is an extremely picturesque area. Surrounding the area pine forests are cut in some places by rivers of lava. 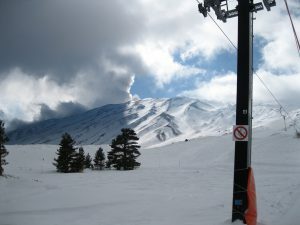 In year 2002 the ski station was partly destroyed by the eruption of Etna. We can still see the remains of the hotel and the lava-burnt trees here. Today, the station has been rebuilt to a greater extent, to the delight of local lovers of winter madness and tourists visiting volcano. 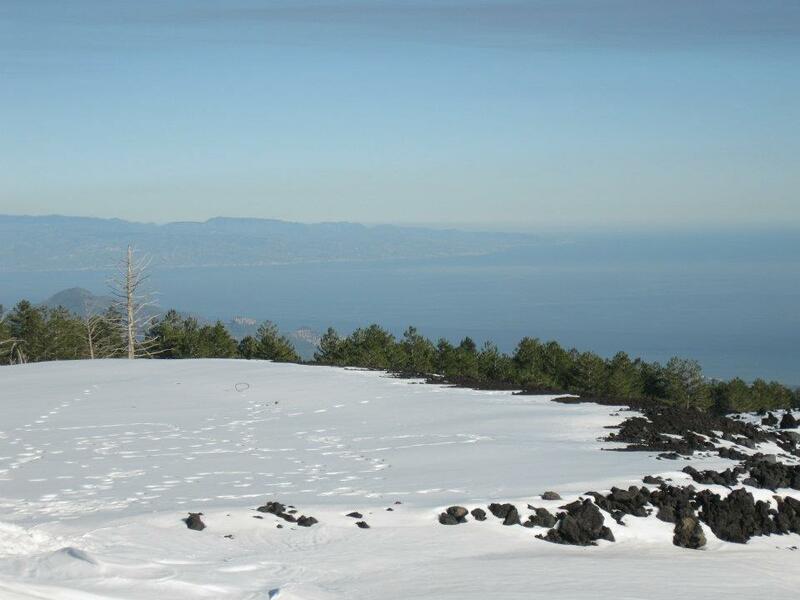 From the slopes in a good weather we admire the view of the Ionian coast from Catania to Taormina. We can even see Calabria from here. 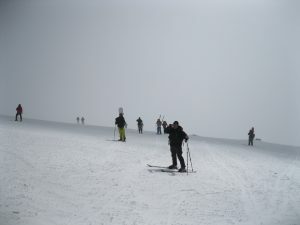 Above the slopes dominates the smoky north-east crater of the highest active volcano in Europe. 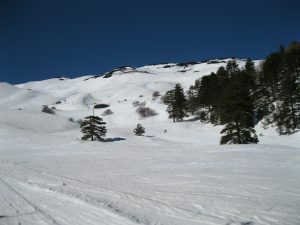 There are one chairift (Puchoz Tanaurpi) and three ski lifts (Monte Conca, Coccinelle, Anfiteatro) on Piano Provenzana. The Puchoz Tanaurpi was completely restored in 2007 after it was destroyed during the Etna eruption in 2002. The name Tanaurpi in the Sicilian dialect means the fox hole. The name Puchoz was given to commemorate an Italian alpinist Mario Puchoz who died during the expedition to K2 in 1954. 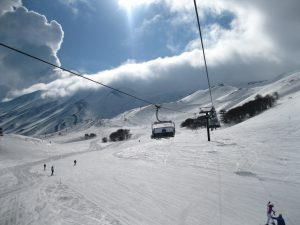 It is an easy slope that we reach with a comfortable chairlift. 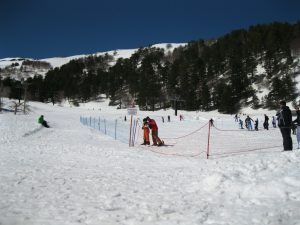 The route runs through the pine forest and is ideal for beginners. Four-seat chairlift with windscreen guard. While being pulled up the slope of Monte Conca you can admire the majestic north-east side of the volcano and its canals. 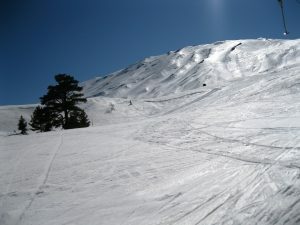 The slope initially is quite steep and after about 300 meters becomes mild. From the route you can join the blue Tanaurpi trail or run to the starting point of Monte Conca. 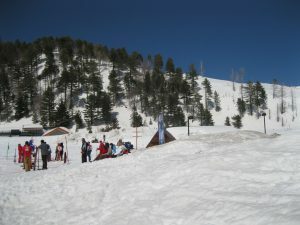 You can get off the skilift half way, which is an option for less experienced skiers and children. 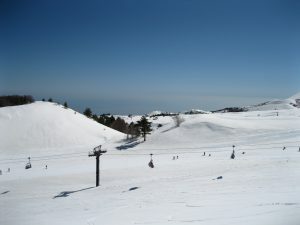 From the top of Monte Conca you can reach the skilift to Coccinelle or Amphitheater (both red slopes). Coccinelle is the most technical route on Etna. The name Cocinelle means ladybirds and refers to their numerous presence in this area of the volcano, especially in the spring and autumn. At the top we admire the north-east crater, about 3330 meters high, as well as the spectacular landscape of the Ionian coast, Taormina and Calabria. We also see nearby smaller craters, such as Monte Nero and “bottoniera del 2002”. Cocinelle is particularly appreciated by local skiers. 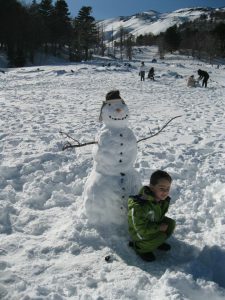 From the Coccinelle trail you can get down directly to the slopes of Tanaurpi or Monte Conca. Instead, by going to the right, you can choose the route leading to the Amphitheater trail. 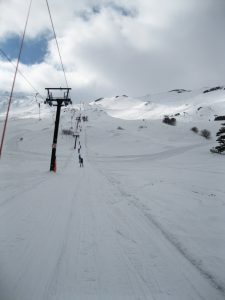 From the top of the Cocinelle it is also possible to take the beautiful off piste trails. 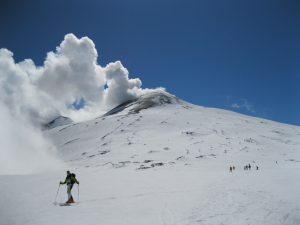 For skiers practicing skitouring, this is the perfect starting point to climb the highest volcano in Europe. At the top of Anfiteatro we can choose between red routes, one of which is approved for professional alpine skiing. The trails are parallel. 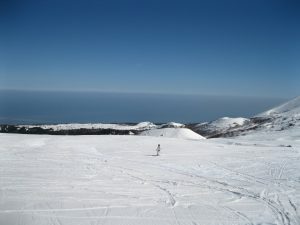 Coming down, you can admire the view of the Ionian Sea and looking towards Etna, its majestic canals that attract the experienced off piste skiers. The name of the trail derives from the morphology of the area at the foot of that slope, which form resembles an amphitheater. Paradoxically, this trail is often closed due to excessive accumulation of snow blown by the wind. From the Anfiteatro route you can return to the Monte Conca trail and continue down. The Anphitheater is also the ideal starting point for ski tourers who want to reach the highest volcanic slopes. 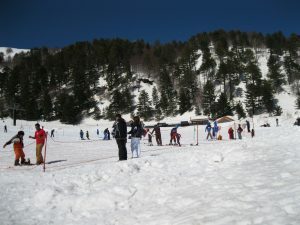 At Piano Provenzana, at the foot of Monte Conca there is also a beautiful 5 km cross-country ski run. The trail is incredibly picturesque, immersed in pine and birch forest. 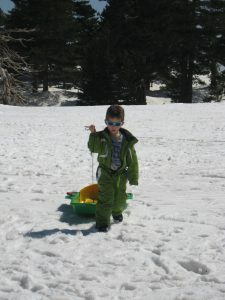 There is also a ski school and a rental shop. 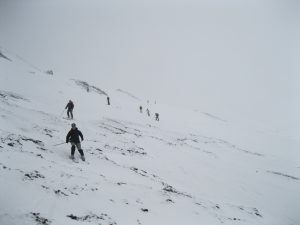 The cost of ski passes varies according to the hours of use and the number of open trails. 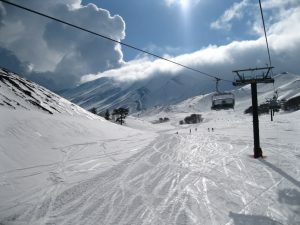 Full day ski pass (from 9:00 to 16:00) costs around € 30.00. 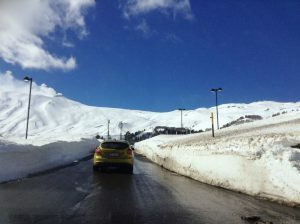 The afternoon ski pass (12:30 to 16:00) costs around € 20.00. 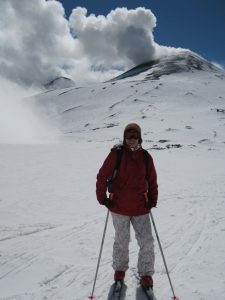 About €20.00 per day for skis, boots and sticks depending on the brand. 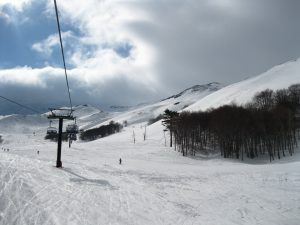 Snowboard equipment costs around €20,00 / €25.00. 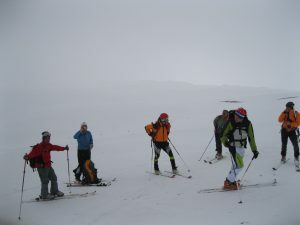 Snowshoe rental €10.00 per day. 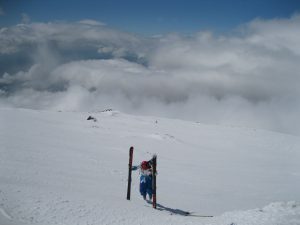 Some rentals, such as the Capannetta in Linguaglossa, also rent ski touring skis, including climbing skins for €25,00 / €35,00 depending on the model. 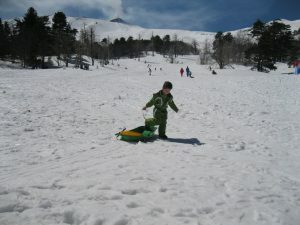 You can also rent a sledge for about €10.00. The only hotel on the Piano Provenzana, Le Betulle, was destroyed during the eruption in 2002. 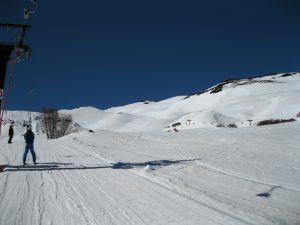 The nearest accommodation is located now 4 km from the slopes and is the Ragabo Ragugio (Rifugio Ragabo) and Brunek, the mountain-style cottage. A bit further from the slopes, in town of Linguaglossa, you will find lots of nice B & B. From Linglaglossa you can reach the slopes in 20 minutes by car. Before you decide to go up to Piano Provenzana, make sure the lifts are open. 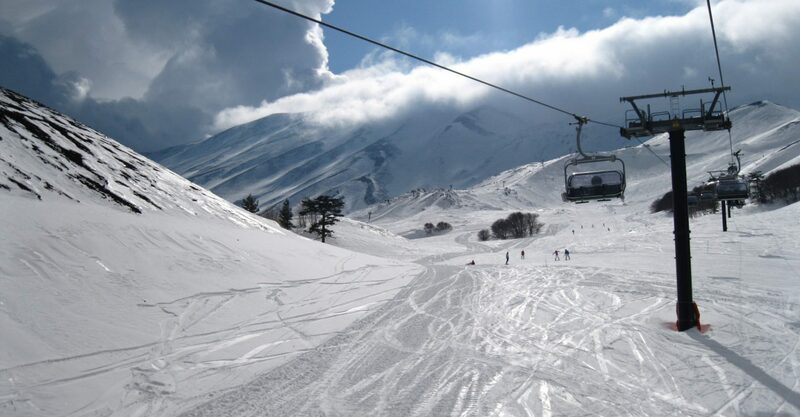 Often, due to strong wind, high temperatures or too heavy snowfall, some lifts are closed. Below you find links to useful sites and services. Unfortunately, everything is written in Italian only! You can also call or write me. I usually have updated information. By car. Highway Catania-Messina, exit Fiumefreddo. Then follow direction Linguaglossa. 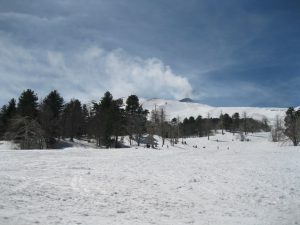 From the centre of Linguaglossa follow indications for Etna Nord and the Mareneve roadin direction of Piano Provenzana. In case of high snow or icing tyre chains are necessary. 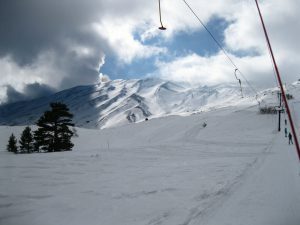 Etna Sud, Nicolosi – Unfortunately, the south side of the Etna is much warmer and the skiing conditions are usually poor. Late in the morning the snow begins to melt and becomes muddy. I don’t recommend. Madonie Piano Battaglia – I’ve never tried, but my friends say it’s beautiful. The 'Trails of Sicily' is an invitation to visit Sicily, to discover its natural charms, culture, customs and, of course, the flavours. 'Trails of Sicily' are relaxing walks, ambitious trekkings, photography, food tasting, chatting and above all unforgettable emotions. Read, have a look and visit me. I will walk you through this full of contrasts island, which became my home ten years ago. I will show you some hidden nooks and tell you the stories not mentioned in traditional guides. Follow me. Vendicari – among nature, culture and paradise beaches.